I have waited for what feels like forever to say that, and boy oh boy it is more than I ever dreamed it would be! I could not be more in love with these precious babes. The overwhelming amount of joy that they brought to my heart and home is a feeling I wish I could bottle and keep forever. Basil & Biscuit were officially born in Salem, Utah on January 5th 2019. 2019 (aka my “golden” year)… The way the world works as far as timing and events like these is crazy amazing to me. 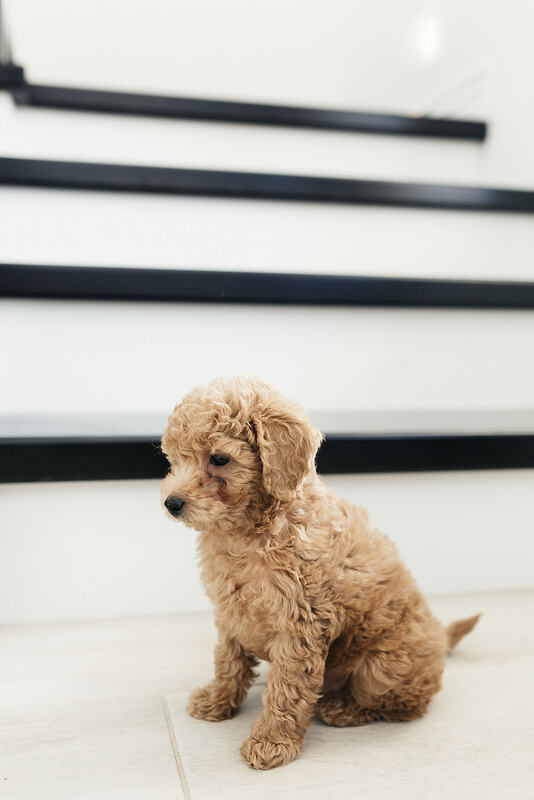 Puppies Designed– I could not have been luckier to have found such a genuine and amazing breeder. She takes such amazing care of all her babies that when coming home they were such wonderful pups already. She provides so much info from her site, to the emails, and text updates that It helped put me at ease a bit for when they would come home. Another thing I loved was her weekly if not daily update on Instagram of the puppies since the moment they were born. Apricot, however, basil is a lighter tone. Eight weeks of pictures, phone calls, video chats and Instagram updates later, I finally got to drive that hour and a half to meet the loves of my life face-to-face on February 28th. My initial reaction was “OH MY GOSH they are sooo tiny (only like almost 3 pounds each)!”… Not a single picture could do them justice. I didn’t think it was possible but they were in fact EVEN CUTER in person. I took my second sister (Carina, my brother’s girlfriend) with me so she could keep them safe while I drove home. The longest and scariest car ride of my life, as I was so nervous to even go over 25 mph…I had precious cargo after all. Yet at the same time, I felt like I couldn’t drive fast enough because all I wanted to do was snuggle their little faces. We arrived home, and although they were a bit unsure of their surroundings, I swear the three of us bonded instantly or at least I felt it haha. Can’t speak for them. I was nervous it would take longer for them to attach to me or a few days to connect as they may miss their mama or litter mates, so I was very grateful for that right off the bat. However, I do think it helps they had each other. I think because they had each other it was a little easier for them to adjust. As the first couple weeks were an adjustment for the both of us, nothing is better than seeing their sweet faces every morning. My babes are very little so they can’t hold their bladder for very long. Right off the bat I tried to avoid accidents inside, so I set an alarm on my phone to go off 30 minutes at a time. Once the alarm went off I would take them straight out to the grass. Sometimes they would go right away and sometimes it would take another 20 minutes, either way they were outside and slowly learned that outside is where they go to….go. During the nights of the first two weeks, the little babes got up about every 2-3 hours having to go to the bathroom. I am crate-training and the crate is near my bed so, of course, I hear them whimper in the middle of the night to go potty. This is when I switched up the bedtime routine. Take away food and water after 7:30p.m. Take them out one last time right before going to bed to ensure potty success before putting them in the crate. They are so little so they would play in the beginning about (45 min), sleep a bit (varies), repeat…much all day! This has been a little challenging as the pups haven’t been big eaters (which of course freaked me out at first ). However, I was told that is normal during the adjustment period. First week I was setting out a 1/2 cup of food for each of them 3 times a day. So they could graze when hungry. However, they probably only ate 3/4 cup a day the first week to be honest. Week two they started to eat a bit more and by week three they are eating a cup to a cup and a quarter maybe. I leave water out always and they do drink a lot of water. That’s great! This week has gone much better after switching up the bedtime routine and being consistent with it. They are sleeping through the night now from 9Pm to about 4-4:45a.m. and then I put them back to sleep and they sleep until about 6:15-6:45a.m.! When taking the puppies to go to the bathroom in the middle of the night, I learned that it is very important to make sure you aren’t interacting with them too much (as hard as it is!). They need to know that it is not play time. I open the crate and pick both of them up. So their feet don’t even touch the ground until I walk outside and place them in the grass. After they do their business, I pick them back up, kiss them each on the head, and put them back in the crate. I keep a blanket over the crate so that it keeps the light from coming in. Also, it keeps them from seeing me so they can fall right back asleep. *They sometimes whimper for a bit, but they will fall back asleep, so don’t go pick them up, stay strong. (I know it is very hard, I have had to move to the couch a couple nights so I: 1. Didn’t have to feel bad for listening to them cry and not picking them up, and 2. So mama could sleep). Puppies can and may cry at night in the beginning, TRY NOT TO WORRY. This is normal as they are adjusting to a new place and being away from their (biological) mom and siblings. 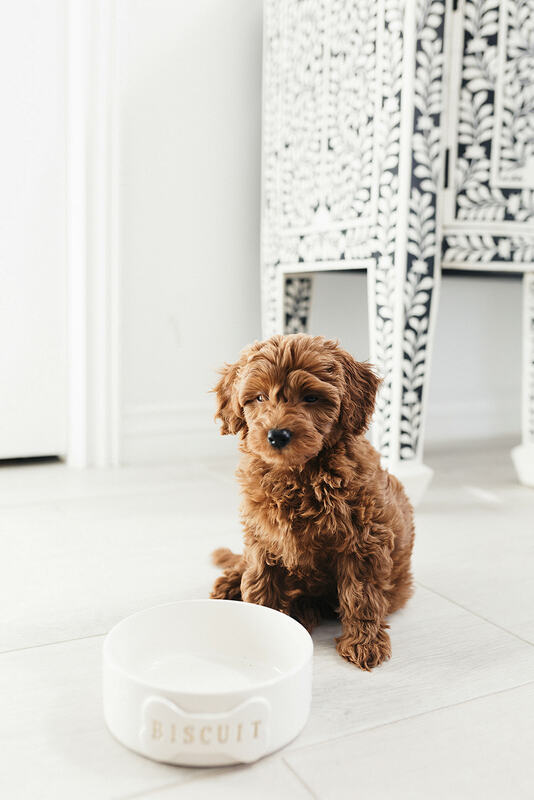 Your pup might not eat very much the first two weeks. Monitor them of course. But don’t be alarmed as they are still adjusting. If you think something is off with your pup or are worried, have questions, etc CALL YOUR VET! If your breeder had them on food different then the food you plan to feed them, try to incorporate your food slowly. I took him to the vet immediately the next day and after everything came back normal from the poop sample and checking his vitals she informed me that even the slightest change to their diet can upset their tummies. My puppies are so small so their tummies can be even more sensitive. If you need to go to the vet shortly after bringing your pup home because you think he is sick, they will most likely ask for a poop sample. I didn’t know this, so I had to go back home and try to get one that day. Avoid the extra time and bring one in to the vet with you for the original visit, you will get the results faster and won’t have to go back and forth. As far as training and teaching these babes goes, I think I will be looking into a trainer. 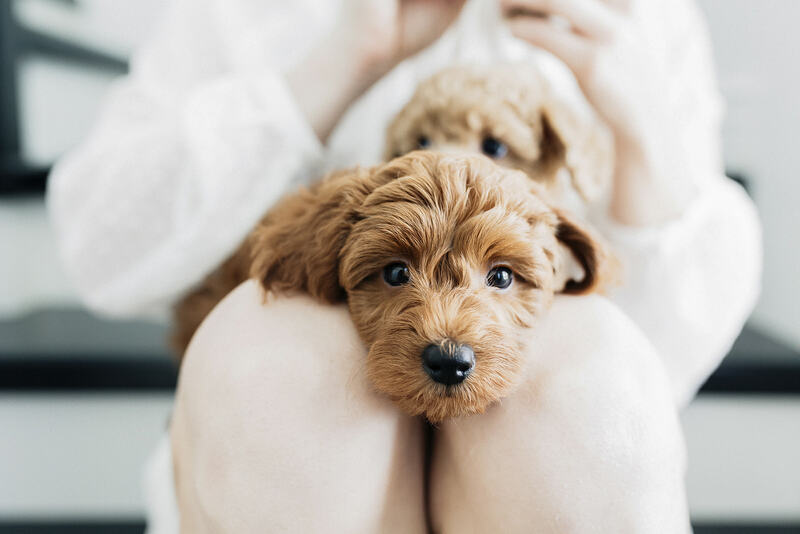 If you want to train them on your own, and are getting two puppies, it is best to crate one and train one at a time so they don’t get distracted. It is ultimately easier for you. Create some sort of a routine. So they know you run the house and they don’t (everyone’s routine looks different due to their work schedule, life, etc.). Every PUPPY and PERSON is different. So remember you are doing your best and do whatever works for you and your pup! 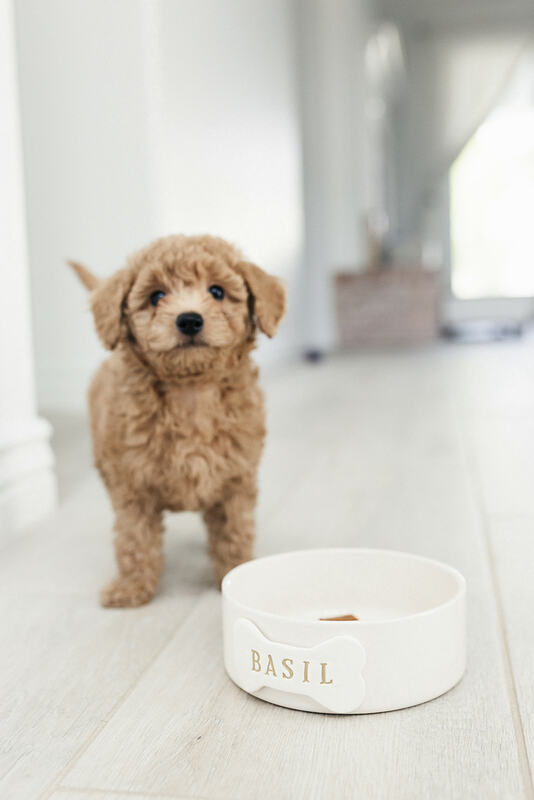 I am working on getting my pups onto an eating schedule. But again as they adjust, they haven’t been eating much so I leave food out for them and they have been eating when they are hungry. (I worried they were not eating enough, but my breeder said they are still so small, and it is still early. Also, if they are hungry…they will eat). I am struggling with getting them to eat out of their bowls. I started hand feeding them because like I said I was worried they were not getting enough food. So I would hold them and feed them one piece at a time haha. Well this can end up being a bad habit that I don’t want them to get used to. luckily my breeder informed me they will eat if they are hungry, so leave the food out. Again, my puppies are really small so being extra cautious about parvo is very important. My vet suggested NOT taking them out to public places or interacting with other dogs until they got all of their shots. She said that they could interact with other dogs after the first round as long as you knew the other dogs were clean and have their shots. However, because of their size, I decided to keep them in a little bubble until they not only had all the shots but also grew a little more. I also never let them go in the front yard as I learned parvo can live airborne for 1 year! So yes, crazy CAUTIOUS DOG MOM over here. The Pups are a little over 3 months old now, and have been home only a little over 3 weeks. As they grow into themselves and into our home I will give you guys another update. 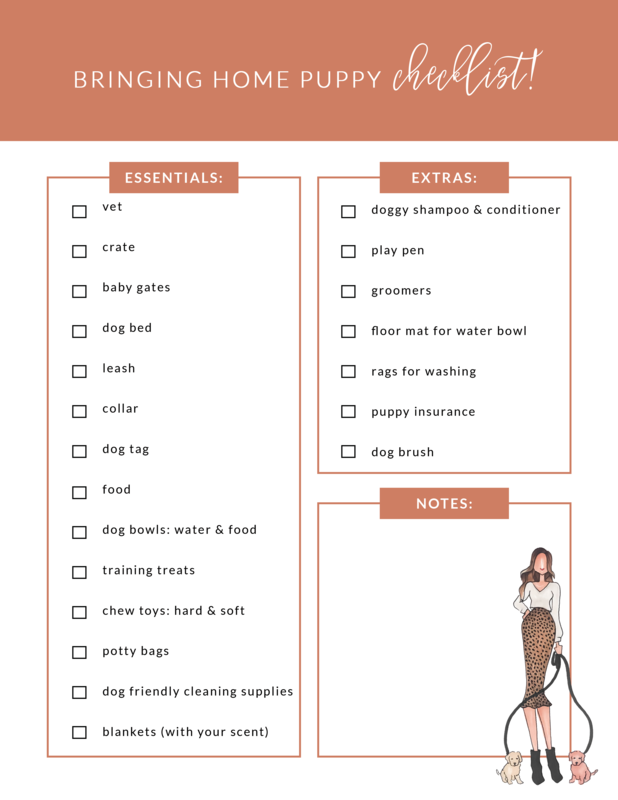 My favorite part about this whole post is what I created for you guys…my “bringing home puppy checklist”!! All the essentials and extra things I needed to get and didn’t know I needed when bringing home the babes. Now this list is pretty basic, so I left an area for notes for added personal things! 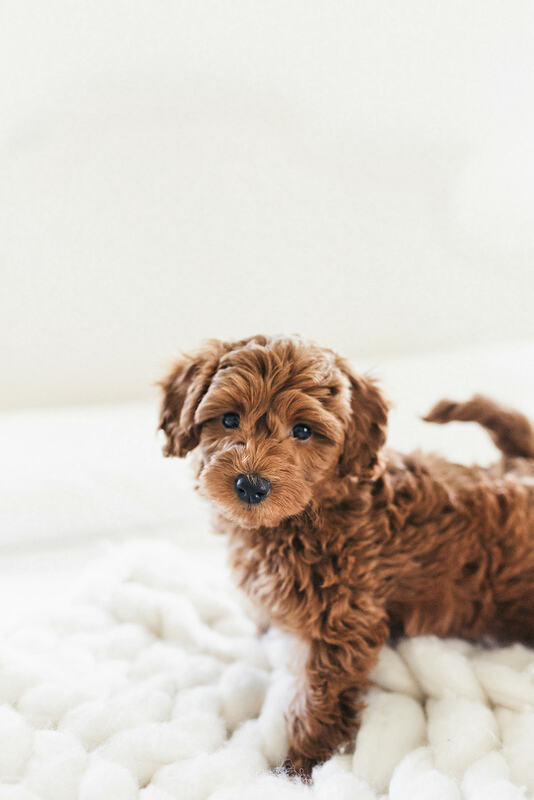 Click “bringing home puppy checklist” here to download! My hands are defiantly full but my heart is even fuller!! You might also like… Morning Smoothie Recipe, Say bye to sleepy eyes! !, and Inflammation: What It Is & How To Reduce Inflammation In The Body. < Previous Article29 things Im looking forward to in my 29th year! Next Article >How to make your floral arrangements last longer at home!